This is the second SGN made in 2007 on this vineyard. 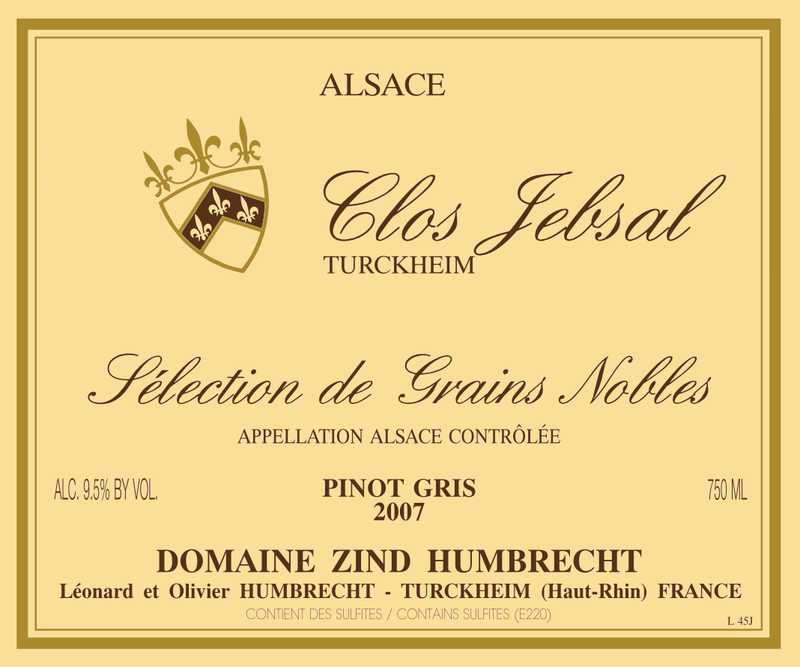 The first selection was the richest (Trie Speciale) and this one is closer in style to a classic Clos Jebsal ‘Sélection de Grains Nobles’. This little Clos is capable to produce some of our richest and sweetest wines, but this wine is for me what a classic SGN should be from Alsace. The purity and quality of the noble rot was excellent in 2007. It allowed both sugar and acid concentration, without loosing elegant aromatics and without high volatile compounds. The fermentation was relatively fast in this wine (about 5 months) which allowed us to bottle it only a year after the harvest. Of course the finished alcohol is low in 2007 because acidities are extraordinary high. 2/2009: the nose is today showing a combination of classic minerals (wet stones) and luscious fruity flavours. The honey/waxy character is elegant as the botrytis is by far not overpowering the wine. The lower (but normal at this richness) alcohol level make the palate taste delicate and deliciously sweet. The sweetness is perfectly controlled by a very high acidity, which gives a vivacious and lively finish. As with all 2007s, acids were very ripe, so the structure of the wine is firm but not green at all.